When it comes to best beaches in Indonesia, Lombok's beaches do not fall far behind Bali's. 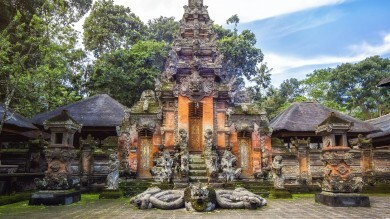 Walk into any crowd and mention Indonesia and you will realize that there is one common name that spurs from their mouths - Bali! Of course, Bali is a rather too common destination for those beach-vacationing in Indonesia, so common that it diverts people's attention from other equally good and perhaps better islands, like Lombok! Located to the East of Bali, beaches in Bali are adored for its silvery sands, sparkling waters and surf-turf. There are lots of other perks in Lombok like snorkeling and diving to be done here. So, if you are looking for a cooler alternative to the over-crowded Bali, then Lombok’s beaches should be your first consideration! 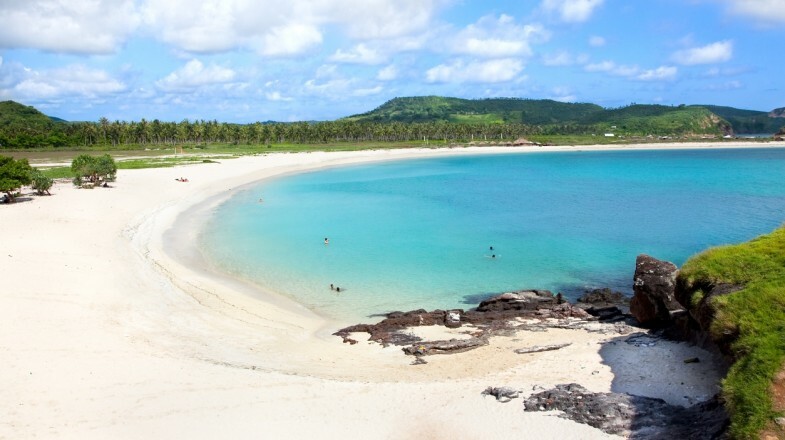 Here are some of the finest and exquisite beaches to check out. Pandanan Beach is that type of beach that makes you feel like you are chilling on your own private island due to the fact that this place has a scarcity of tourists! Which is a blessing for those who enjoy calm and serene vacations with a tropical feel and breathtaking scenery filled with crystals of sands and soothing waves. It's best to rent a vehicle that will take you to Pandanan Beach, as it is near impossible to get here using public transportation. There are very limited restaurant services here, so it's best to stock up on some food supplies and also if you want to snorkel, bring your own equipment. 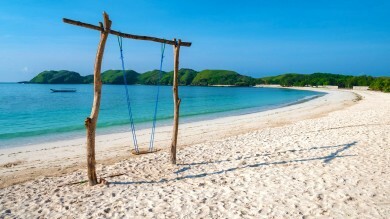 This 6-Day Lombok Getaway package is a great way to discover the island and its beaches. The Pink Beach in Lombok gets its color from the dead sea corals that are washed on to the beach. Pantai Merah AKA Pink Beach, is a truly incredible beach that will have you in awe. 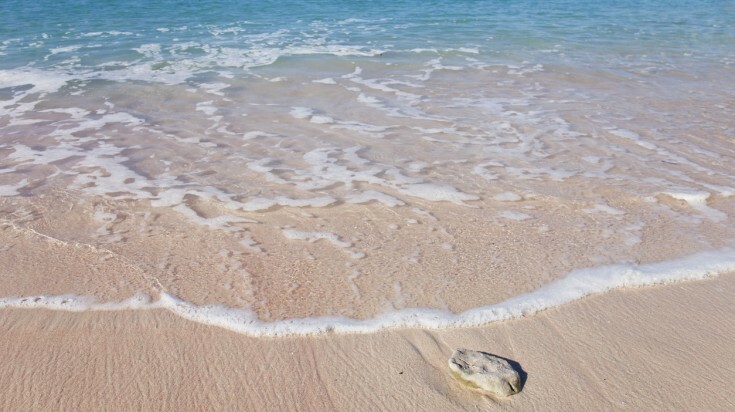 It is amongst one of the seven pink beaches on the planet! The pink color of the sand is due to fragments of dead sea coral getting washed on to the beach. This secluded beach is rarely visited as there are no water sports available, although there are options of snorkeling and diving. But less crowds and stunning scenery makes this place a mystical and romantic destination in Lombok. Getting to Pink Beach is not an easy task, especially for a tourist as there are very few road signs and the roads get trickier with each mile. It's best to rent a driver or book a tour guide. Head out for the beach early in the morning to make time to explore the caves nearby. 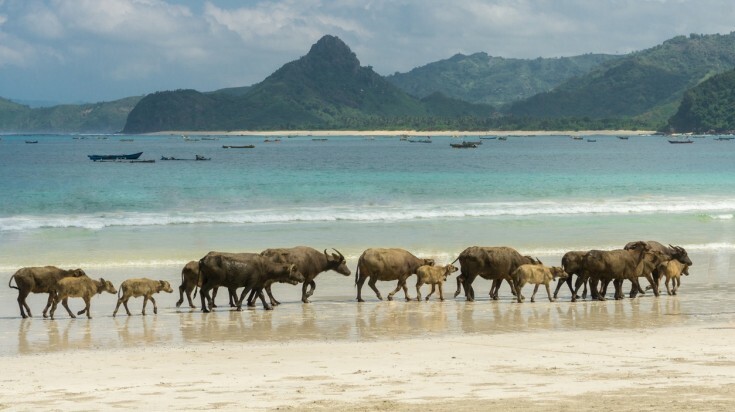 At Selong Belanak beach, you will often find herds of buffaloes wandering by. Selong Belanak is among the most esteemed and beautiful beaches in Lombok island. It is unfading in its beauty and unique crescent shape of the shore and happens to be an extension of the Selong Belanak bay which is parallel to the Indian ocean. One key feature of this beach is the presence of fishing boats scattered on the waterfront. Lots of local families work here as fishermen, and you will have a great time relaxing on the shore and watching them go about their duties. This beach is tranquil and less crowded. Due to the presence of so many fishing boats, water activities are done from the central to the north side of the beach - these zones are free of fishermen. Don’t be shy to ask for directions to the beach, as road signs aren't easily available. This beach is cozily situated between two hills. 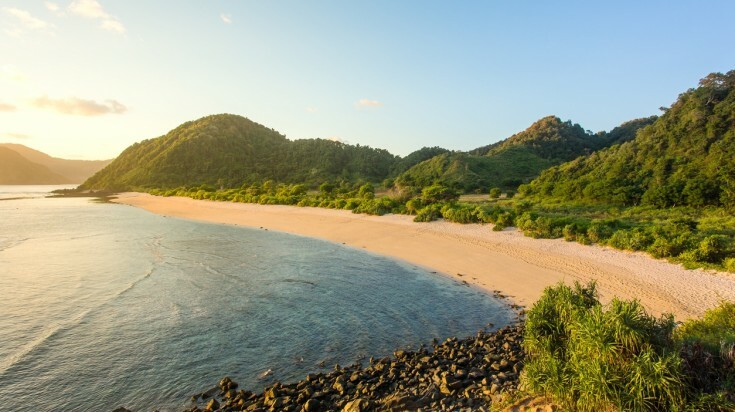 The Mawun Beach is another awe-inspiring destination in Lombok. Barricaded by two gigantic hills in the West and East sides respectively, this beach is cozy as it is calm and collected. Let your feet sink into a mast of white and pebble-like sand enclosed by a clean ring of blue water fit for swimming and other fun water activities. The waves around the hills are much harsher and stronger, so be weary about this area and also have in mind that lifeguards aren't available on this beach. Be careful! There are barely any food vendors on the beach, and if you do eventually find a vendor, the prices are kept ridiculously high. So bring some snacks and food supplies along, you do not want to enjoy the thrill of this beach on an empty stomach. The Kuta beach has a 7km long coastline. Kuta Beach is a rather crowded beach in South Lombok, however it is just as good as the others on this list. This beach, due to its popularity with tourists, has lots of places to lodge and quaint restaurants to wine and dine at. It's 7km coastline is littered with stubs of hills for you to climb and gaze at the horizon. This beach is great for the views and impeccable food. It is wise to bargain price for each service, especially when it comes to snorkeling equipment rentals. The Seger Reef Homestay is a great place to lodge. It is located on the beach front and has Wi-Fi and hot baths available with amazing security. The Tanjung Aan beach charms beach-goers with its sparkling white sand. Tanjung Aan can be found sparkling with bliss and joy in the southern part of Lombok. This beach stretches for about 2km and has a crescent shaped bay. 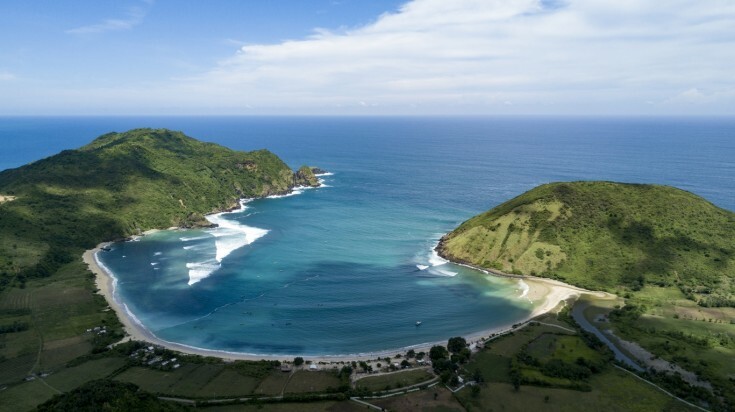 It is a beach with lots of allure and myth - according to the legend, the beach is home to a princess named Mandalika who jumped to the sea to avoid the advances of princes and became a sea worm, which happens to be a major food source for the locals. To tap more into the mystical and cultural nature of Tanjung Aan, it's best to visit the beach in February, as this is when the annual Bau Nyale ritual is held dedicated to the princess. 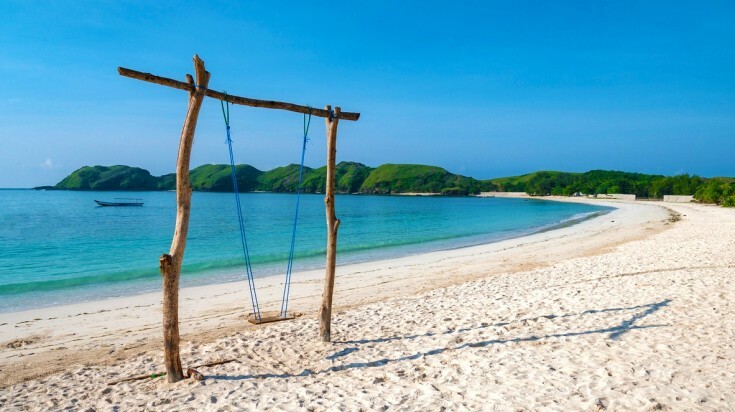 Check out this 11-Day Tour in Lombok that will have you enjoying the beaches, island hopping and exploring Komodo Island. It's hard to run out of beaches in Lombok to relax and enjoy water activities at. The island is blessed with so much appealing landscapes that will have you making picture-perfect memories in no time. Just relax, listen to the calm and airy call of nature, and do not forget to bring some sunscreen! If you want more adventure in Lombok, check out our travel guide on Mount Rinjani Trek or discover the island on a bicycle with this tour.